The best waste and recycling company in Adelaide! Finally YOU Have a Local Waste and Recycling Company Offering YOU Reliability, Cost Effectiveness And Five Star Customer Service. So to make sure YOU are getting the best service and deal pick up the phone or fill out the quote form and start talking to your locals. Micheal and Allen Bolderoff welcome you to Signal. Five star customer service is what sets Signal Waste apart from our competition. Signal Waste prides themselves in providing their clients with open communication and dedication, quality and satisfaction on every service provided. This means NO call centres and NO interstate sales or accounts management. The Bin Boys as they are known in the industry have a 'CAN DO GET THE JOB DONE' attitude and instil old fashioned work ethics throughout their fully trained team. Which means, from the time the friendly staff receive your call, to the handshake and introduction of the sales department, to the time the bins are delivered and serviced by Signal's reliable drivers, every small detail is dealt with and accounted for. This is backed up by Your Five Star Customer Service Guarantee. See our terms and conditions for further details. Signal Waste and Recycling which was established in 1989, is a fully licensed, locally family owned and run business headed by Allen and Micheal Bolderoff. 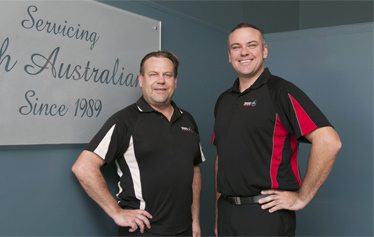 The Boys have been in the waste industry for over 25 years providing a one stop shop to over 1000 customers from commercial, industrial, local, state and government sectors. The company is at the forefront of technology and is an innovator and trend setter for the South Australian waste and recycling industry. An example of this is that Signal's front lift industrial waste division was the first to divert waste from landfill, to waste to energy in South Australia.